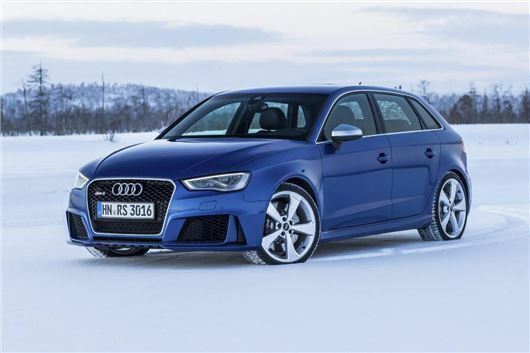 The Audi RS3 Sportback is available to order, priced from £39,950. The high-performance five-door hatchback can get from 0-62mph in 4.3 seconds and has a top speed of 155mph. Audi will remove the 155mph limiter on request, raising top speed to a barely believable 174mph. Peak power from the 2.5-litre engine is 367PS, with 465Nm of torque available from 1625rpm to 5500rpm. The gearbox is a twin-clutch S Tronic with seven speeds, linked to a quattro all-wheel drive system that can send between 50 and 100 per cent of torque to the rear axle depending on the situation. Fuel economy is 34.8mpg and emissions are 189g/km. UK cars will arrive in March and are set to get 19-inch alloy wheels, RS styling, LED headlights and a roof spoiler as standard. There are eight colours to choose from including Catalunya Red Metallic, which is exclusive to the RS 3 Sportback. The cabin is finished in Nappa leather and Alcantara. Audi’s MMI infotainment system is fitted as standard and includes iPod and Bluetooth connectivity, but navigation is an optional extra. Other options include RS Bucket seats and an ‘interior design package’, plus a more advanced version of MMI with navigation and online connectivity.